Colombia: a choice between mining and food? Last month, I represented Colombia Solidarity Campaign on a delegation organised by US organisation Witness for Peace to La Guajira in northern Colombia. We went to visit communities and workers affected by the massive opencast Cerrejón coal mine, owned by London-listed companies Anglo American, BHP Billiton and Glencore. Much of our time was spent in communities directly impacted by the mine, some of whom we have been working with for many years. But we also visited members of the Comité Cívico por la Dignidad de La Guajira, the Civic Committee for the Dignity of La Guajira, an organisation based in the departmental (provincial) capital, Riohacha. The Comité Cívico is working to produce an overview of the impacts of mining in La Guajira and to encourage unity in the struggle for justice. The Comité Cívico has collated and analysed official Colombian government statistics to examine whether it is really true, as governments and mining companies tell us, that mining is bringing prosperity to La Guajira. The background to the question is the death, in recent years, of around 5,000 indigenous Wayuu children from malnutrition. The Wayuu are the most populous Indigenous People in La Guajira. If the mine is bringing progress, why are children dying? Our friends in the Comité Cívico presented us with an impressive quantity of information. They told us that 56.5% of Colombian coal is in La Guajira – 3,728 million tonnes of it, together with 43.4% of Colombian natural gas (with production of 400 million cubic feet daily). Oil reserves have been discovered and there is huge wind and solar power potential. Since 2000, they told us, Colombia has specialised in resources and energy exports (as well as tropical fruit). This exacerbates the problem of extreme poverty that La Guajira has confronted for many years. It produces problems of migration, appropriation of territory by multinationals and a change in production habits – an example of ‘Dutch Disease’ or the ‘Resource Curse’ afflicting countries which are rich in resources but do not make things. In 1985, the population of La Guajira was 362,666. 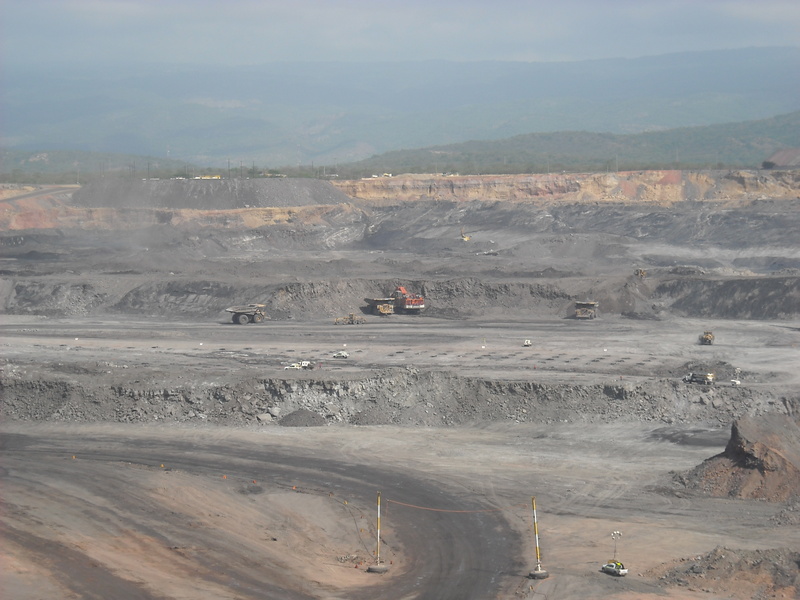 This was the year of the initiation of large scale coal mining at Cerrejón. It was preceded by a media campaign about the progress that mining would bring. The failure of agricultural production in other coastal departments meant that people began to migrate to La Guajira in the hope of work. In 2015, the population was 957,797 – an increase of 264% in thirty years. This has exacerbated all La Guajira’s problems. There has been a change in land use, they explained. There are 73 mining titles in La Guajira. They cover an area of 172,000 hectares, of which the Cerrejón mine has over 69,677. In 2010 there were fifteen mining titles around the one major river in the department, the Río Ranchería, covering over 72,852.5 hectares. Now, 275 further titles are being sought, covering 653,959.5 hectares. Many of the mining concessions overlap with indigenous resguardos (reserves). 70% of the concessions being sought are in the Ranchería River Basin. This will destroy the Río Ranchería, our friends told us, and they believe that this will end the life of the department. There has been a change in production in La Guajira as a result of Dutch Disease. Agriculture and livestock accounted for 39.6% of production in 1960 and only 4.6% in 2010. Industrial production went from 4.3% of the local economy to 0.9%. Commerce dropped from 37.5% to 1.7%. Mining leapt from 0% to 60.9%. Other sectors grew from 18.6% to 31.9%. Mining, they told us, has destroyed La Guajira’s productive capacity. 104,963 hectares of the department are suitable for agriculture; but in 2001 only 30,752 hectares were under cultivation and in 2008 much less. La Guajira has lost its food sovereignty. It has stopped producing sufficient food for its people. That is the cause of the deaths of children in the department – it has been caused by the government and its model of development. Food security (as opposed to food sovereignty), they explained, depends on the amount of income a person has. In La Guajira, around 27% of children under five are suffering from malnutrition – a much higher percentage than in any other coastal department in Colombia. It is the same with anaemia rates among children: in La Guajira 38.9% of children between 6 months and 59 months old are suffering from anaemia. Subsidised food from the government of Venezuela helped, as the Wayuu people live on both sides of the Colombian-Venezuelan border and are binational. But the loss of mining royalties being paid to the departmental government undermined food security. Even though there was some theft of that money, some of it always went to caring for children. In 2010, there was a change in the old system of royalty distribution. Under the old system, 85% of royalties went to the department producing the minerals; now only 9.3% of the royalties come to the producing department. Before the closure of the Venezuelan border, Wayuu families could buy food cheaply in Venezuela. In December 2015, after the closure of the border because of tension between the two national governments, the same basic foodstuffs in La Guajira cost double the previous price. There is enough food, but people do not have the money to buy it. A policy of food security rather than food sovereignty is a factor. They told us that half the territory of La Guajira is under threat of becoming desert: 2% is at high risk, 28% at moderate risk. This helps explain the struggle against Cerrejón. Cerrejón has destroyed over 12,000 hectares of forest. Twelve rivers have disappeared or are disappearing. The Arroyo (stream) Aguas Blancas was diverted, which is what the company wants to do now to the Arroyo Bruno. Now the Aguas Blancas stream is disappearing. In 2014, agriculture used 637 million cubic metres of water. Cattle and fishing used 2,252 million cubic metres. Mining used 11,297 million cubic metres. Out of all the productive sectors in La Guajira, mining consumed over 70% of water used. There are periods when Cerrejón uses far more water than falls as precipitation. The amount used to keep down dust on the roads in and around the mine far exceeds water use by the thousands of people living in the nearby towns of Albania and Hatonuevo. As Cerrejón expands, it uses more water. The Comité Cívico believes that only non-violent social mobilisation will bring about the necessary changes. There must be organised, unarmed civilian resistance. That’s why they have called the 9 August March of the Mantas Rojas. ‘Mantas’ are the traditional long dresses worn by Wayuu women. For the Wayuu people, red symbolises blood, life and land. For the march, women from all the sectors affected by the mine, not only the Wayuu, will wear red mantas – African descendants, campesinos, and other indigenous peoples hurt by mining interests. The Comité Cívico believes there must be negotiations with the government and Cerrejón to derive more benefits from the mining operations. Currently all that local people have felt are the negative impacts of mining. The people of La Guajira also need to get more royalties from the central government and a higher percentage of the earnings of Cerrejón so as to create a development fund whose main function will be to expand the agricultural sector and ensure food sovereignty. They want to stop Cerrejón using so much of the water and destroying what is left of the forests. They are calling for a serious programme of resettlement of all the people who have been displaced – not only through the provision of alternative land but through support for people to regain their productive capacity. Nationalisation of the University of La Guajira should be undertaken as a big percentage of its finances come from royalties. These are the points to negotiate with the government and Cerrejón. And when the current mine lease runs out in 2033, they want the mining interests at Cerrejón nationalised. My visit was funded by Colombia Soldiarity Campaign, Global Justice Now, the Passionist Community and individual donors. Many thanks to all of them.